Thanksgiving Project – May Showers bring June Bugs? It has been an unusual month weather wise here. This weekend it turned cool again, leaving the question in so many people’s minds of where was summer. Only about 59 degrees today, and raining. I am enjoying the quiet inside right now. Soren is out in the barn with Warren and it has been raining too hard to get back to the house. We have been spending time with family today. It was my niece’s graduation open house. My day’s brother drove over from Toledo. It was nice to see him. And then we went to see my oldest living uncle (my mom’s brother). His daughter, my cousin Jenny, is here visiting from Las Vegas. I love that I’m able to stay in touch with my rather large family through Facebook. Okay, now back to some quiet time. I fell asleep reading last night. I think I read one whole page. So enough writing, time for some reading while I can. I’ve really missed my reading time this weekend. So, what am most thankful for today? Hard to narrow it down. But I think one word sums it all up – family! It for sure isn’t the weather. I think that this rain will bring out the already large population of Mosquitos. Luckily they don’t seem to be attracted to me, but I know they are bothersome to lots of other people. April showers didn’t bring the may flowers so much. But I’m sure that the may showers will bring out the bugs in June. So tonight was my walking group. I’m not sure why I am even doing this. But it sounded fun and I had girlfriends doing it. Now I have short little legs, but they move. I naturally walk fast…faster than most people. It makes it difficult for me to really walk WITH someone else. But I was determined to make this work. Last week I wanted to walk and talk with someone I don’t know that well, but we vacationed together in January and she is loads of fun. I hadn’t seen her for awhile so I wanted to catch up. She tried to keep up…and she did pretty well for the first mile…then I lost her. So, tonight she told me to go on ahead of her. We were at the back of the group and I took off. Before I knew it, I had passed everyone. Then I couldn’t even see them behind me. It was a lonely walk. I should have brought earbuds so I would at least have music. I will do that next week though. Then the last half mile one of my best friends who had one with the more advanced group (and part time runners) joined me. That was nice. But even she had to nearly jog to keep up at times. But I discovered a huge bonus in walking fast….the rain started just as I got in my car. It was pouring buckets. My girlfriend was riding her bike home and said it rained so hard it hurt. But all those other women must have gotten drenched. So, my trade off for walking alone was that I was done before the rain. Lucky me! I’m thankful today that I am always a fast walker…and dry. This is starting to be almost comical. 2″ in the rain gauge since last evening…and it’s still pouring buckets. 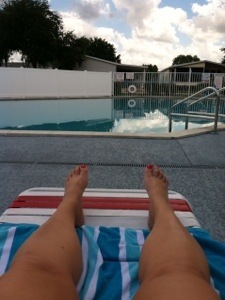 But the good news is I got about 50 minutes of sun poolside before it clouded up and chased me indoors again. Plans for this evening went by the wayside too. My girlfriend works at a college and they have graduation (which she has to attend, of course). We were planning on meeting a couple of her colleagues and their husbands. So, I was going to drop her off, drive to the bar and meet up with men I’ve never met. Sounded like it could be fun. I imagined myself looking for gorgeous men and asking if they were Chuck. Great pick up line, huh? But then we discovered this place was all smoking (certainly not where I want to sit) and was having a heavy metal band tonight. Oh boy! So we scrapped those plans. I’m just staying in until she gets back. Had a late lunch. Will just have some wine and maybe some popcorn for a snack later. But, as a friend reminded me, I’m still on vacation (as in not at work)! I guess I still have that to be thankful for…and that time in the sun. And I do love a good thunderstorm. So tonight is the last night of the conference. The Host City event was at the Indiana State Museum. I remember the days when I could hardly wait for the parties. But I must be getting old or something. We walked via skywalks to avoid the pouring rain. But the last bit was still outside. Glad I had taken my umbrella. It was a nice walk over talking with friends and colleagues. I enjoyed chatting with a few people. I used one of my drink tickets for a Diet Pepsi (doesn’t seem fair that that same ticket could’ve gotten me a glass of wine or a beer, but I digress). I wasn’t really hungry so the lack of hors d’oeuvres didn’t bother me much. But I guess I kinda hit my wall. I’d had enough of crowds, noise, and people. I get like that. Not often, but I know when I’ve had enough. So, I only stayed a short time and walked back alone. That walk was really perfect. I walked in the rain all the way back. It was only a few blocks. At first I thought about paying a cab, but the walk sounded nice. And it was. It was raining hard, but with my umbrella, it wasn’t too bad. I needed the exercise and it wasn’t cold. 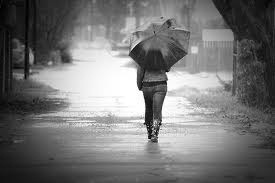 I can’t remember the last time I walked leisurely in the rain. It did my soul good. It was quiet and peaceful. And except for dodging the splashes from cars flying past, I was able to just breathe and be calm. Now I’m ready for the next reception tonight.